Do you believe in love at first bite? Is it possible to fall in love...with a recipe book? One of the first things Elmo's sister, L, showed us in London was her current favourite thing: the Ottolenghi cookbook (well, after her 3 month old son...). This lovely book is written by chefs Yotam Ottolenghi and Sami Tamimi and features Middle Eastern inspired dishes from their restaurant of the same name. We tried only a few recipes from this fantastic book: a roast pork belly dish with a fabulous spicy rhubarb, plum and ginger relish, as well as a roast sweet potato salad. Every dish was an absolute winner. Elmo and I were really excited. You know: all tingley. all we could think was, when can we cook from the book again? what else can we try? how else can we sate our taste buds? Keen to recruit to the Ottolenghi fan club, L immediately ordered another copy online for us to bring back to Melbs. And so, we find ourselves with this wonderful prize, ready to tackle picnics and dinner parties for the summer. Today, I brought an Ottolenghi salad to a family BBQ. 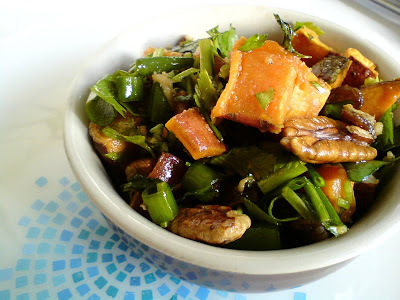 The recipe for this Roast Sweet Potato Salad can be found online. This salad is so simple and easy to make. Lovely fresh herbs with a sweet, zingy dressing. We ran out of maple syrup, so I substituted Stroop (a Danish sweet syrup) from our pantry stash (hope that's ok Kim!). The dressing is quite sweet, thanks to the (maple) syrup, and slightly tangy, due to lemon and orange juice and grated ginger. A great balance at meaty summertime BBQs. And like all crushes, we're keenly anticipating the next time we meet again: a book of vegetarian recipes - Plenty, expected in May 2010. We're not sure if this book is available in Australian bookshops, but you could try the recipes from their site if you're keen, read Yotam Ottolenghi's vegetarian column in the Guardian, or perhaps order the cookbook online (L purchased our copy from Amazon UK). I can't wait to try some of the recipes, they truly do make your mouth water! i hope you do try some of the recipes, we've been really happy with everything we've tried! enjoy! jfox> Book depository is a godsend! Magic G and Serenity Later swear by it- great way to get any book you like! Also those photos look so damn good! 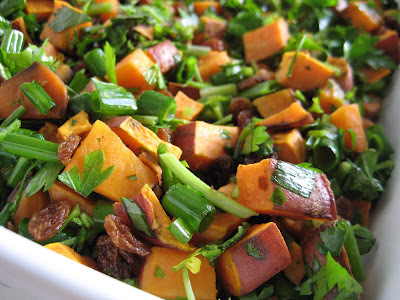 Yum, I love the sweet potato salad, can't wait to try it out! Made this for my dad's birthday- was delicious! Thanks C!